Conan O’Brien Announce Australian Show – Spotlight Report "The Best Entertainment Website in Oz"
Frontier Comedy are thrilled to announce Conan O’Brien – the USA’s longest tenured late night television host – will arrive in Australia next month, with an exclusive show at the State Theatre, Sydney on Wednesday 20 February. 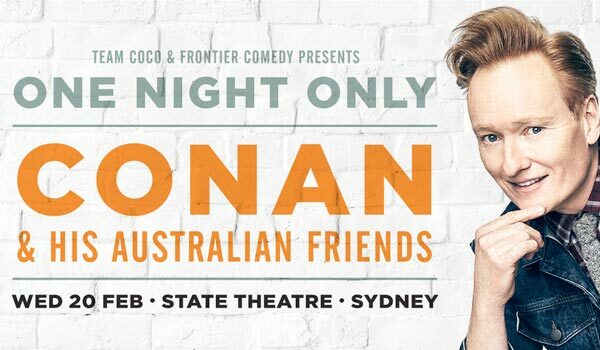 Sign up to access Frontier Comedy’s Pre-sale, which kicks off on Wednesday 23 January (12pm AEDT). General Public tickets go on sale Friday 25 January (10am AEDT). Head to frontiercomedy.com/conanobrien for all the details. COMEDY MEGASTAR CONAN O’BRIEN TO PERFORM LIVE – ONE NIGHT ONLY!